glitter is my favorite color: early present to myself! 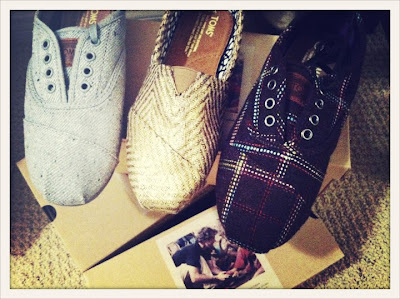 My ex-roommate, super bestie, and fellow blogger extraordinaire, Miss Amy, recently got a job at TOMS Shoes which (fortunately for me) came with a SICK discount! I've always really admired the TOMS mission and do-gooding, but have not been able to afford a pair. Plus there's the fact that I hate wearing shoes and live in flip flops for as long as the weather will allow. I got three pairs today and they are THE next best thing to being barefoot! Super comfortable and cute! Do yourself (and a needy child) a favor and order yours today! I live in southern California. I moved here from Minnesota and before that Georgia. I grew up in a Washington, D.C. suburb of Maryland. I like to wear dresses, daydream about my next meal, and spend every free moment at the beach riding bikes and getting tan. I design children's clothes for a living and accessories in my free time. If I had my way I'd wear a bathing suit all day, everyday and never have to put on shoes again. all original images are property of glitterismyfavoritecolor.com. Please link to me if using.. Simple theme. Powered by Blogger.